What you should have in mind as you plan your 2016 calendar. The Dodd-Frank Act, regulatory guidelines on compensation risk and shareholder advisory votes on executive compensation have all contributed to an increase in the compensation committee’s responsibilities and time requirements. That pressure is compounded this time of year as committees enter their “busy season.” The fourth quarter is the start of many critical and often scrutinized committee activities: reviewing performance, approving 2015 incentive awards and developing 2016 performance incentive plans. 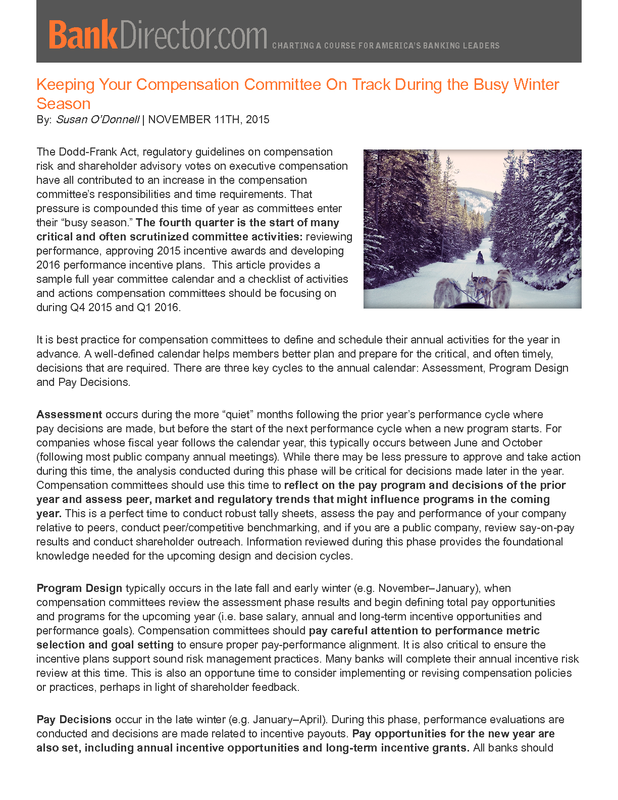 This article provides a sample full year committee calendar and a checklist of activities and actions compensation committees should be focusing on during Q4 2015 and Q1 2016. It is best practice for compensation committees to define and schedule their annual activities for the year in advance. A well-defined calendar helps members better plan and prepare for the critical, and often timely, decisions that are required. There are three key cycles to the annual calendar: Assessment, Program Design and Pay Decisions. Assessment occurs during the more “quiet” months following the prior year’s performance cycle where pay decisions are made, but before the start of the next performance cycle when a new program starts. For companies whose fiscal year follows the calendar year, this typically occurs between June and October (following most public company annual meetings). While there may be less pressure to approve and take action during this time, the analysis conducted during this phase will be critical for decisions made later in the year. Compensation committees should use this time to reflect on the pay program and decisions of the prior year and assess peer, market and regulatory trends that might influence programs in the coming year. This is a perfect time to conduct robust tally sheets, assess the pay and performance of your company relative to peers, conduct peer/competitive benchmarking, and if you are a public company, review say-on-pay results and conduct shareholder outreach. Information reviewed during this phase provides the foundational knowledge needed for the upcoming design and decision cycles. Program Design typically occurs in the late fall and early winter (e.g. November–January), when compensation committees review the assessment phase results and begin defining total pay opportunities and programs for the upcoming year (i.e. base salary, annual and long-term incentive opportunities and performance goals). Compensation committees should pay careful attention to performance metric selection and goal setting to ensure proper pay-performance alignment. It is also critical to ensure the incentive plans support sound risk management practices. Many banks will complete their annual incentive risk review at this time. This is also an opportune time to consider implementing or revising compensation policies or practices, perhaps in light of shareholder feedback. Pay Decisions occur in the late winter (e.g. January–April). During this phase, performance evaluations are conducted and decisions are made related to incentive payouts. Pay opportunities for the new year are also set, including annual incentive opportunities and long-term incentive grants. All banks should have conducted their risk assessment review by this time as well. Once Section 956 of the Dodd-Frank Act is finalized, banks will be required to provide documentation of their risk review to regulators. For companies whose fiscal year ends at the end of the year, this will occur during the same timeframe, in the late winter or early spring. This is also a very busy time for public companies that are required to document the prior year’s pay decisions in the proxy in preparation for shareholder review. Many committees spend several meetings discussing these issues. Periodic activities include, but are not limited to: executive and board succession planning, incentive risk assessment, board and committee evaluations, consultant evaluations, benefit plan review, employment agreement/severance arrangement review and shareholder engagement. Ongoing updates throughout the year include incentive payout projections and regulatory updates. 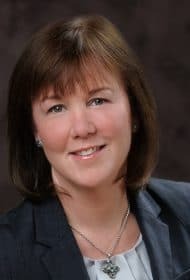 Today’s environment of increased scrutiny on executive compensation and governance requires compensation committees to spend more time fulfilling their responsibilities. Having a well-planned calendar, with a heightened focus on the “off season” assessment activities, can help committees be better prepared for the many critical year-end decisions. *Section 162(m) of the Internal Revenue Code allows public companies to deduct performance-based compensation above $1 million if it meets specific requirements.